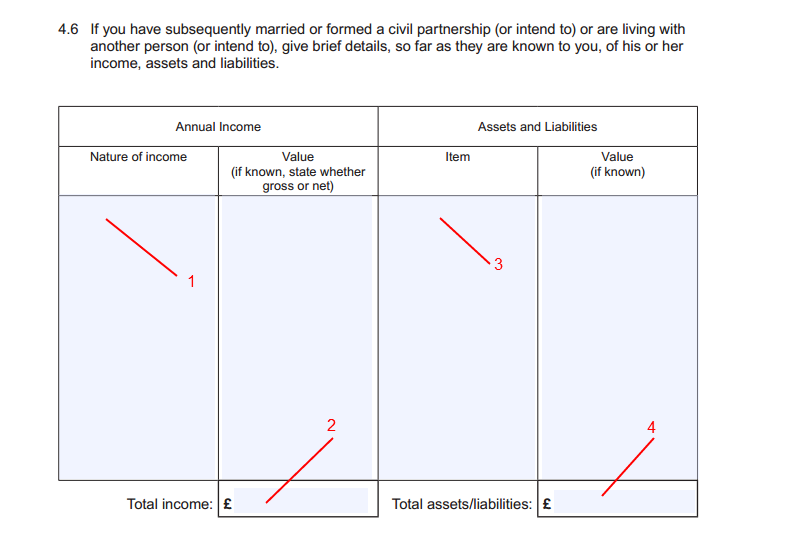 This post follows on from Form E: Section 3 financial requirements. It takes you through the remaining parts of Form E, sections 4, 5 and 6. 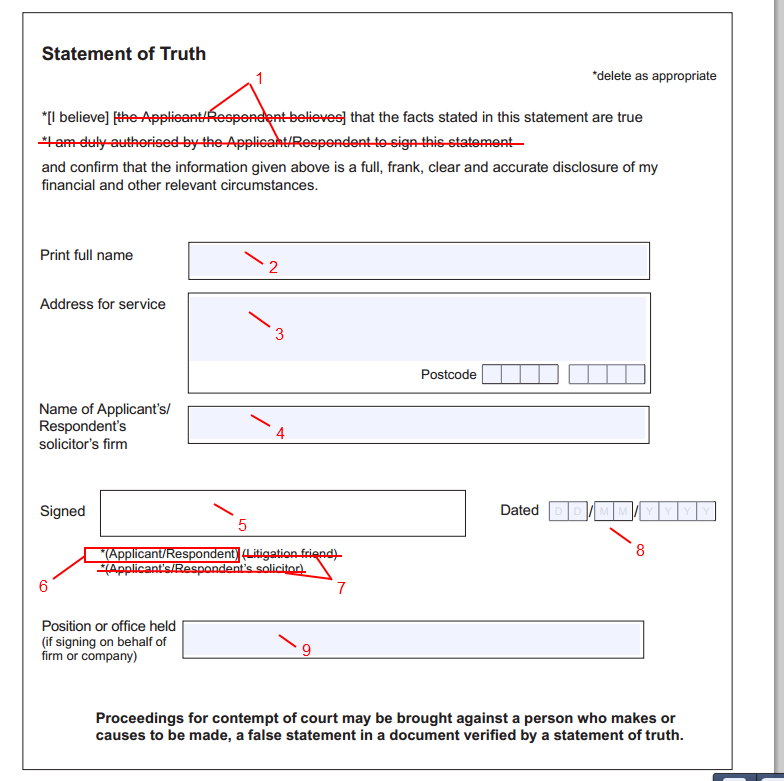 You have now completed the information gathering part of the Form E. The rest of the form is your opportunity to put your case. 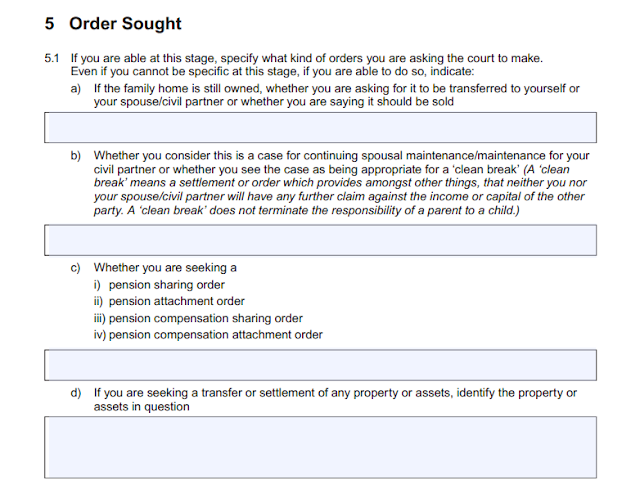 However do be careful how you fill these sections in, as they can easily lead to your ex-partner becoming very annoyed and feeling aggrieved when they read it. You should try very hard to avoid provoking this reaction as it will make settling the case that much more difficult – which is really not what you want. An example of how contentious this part of the Form E can be is that when completing a Form E in mediation most decent mediators ask you to ignore this section of the Form. You can’t do that within the Court process – but just be careful what you say! 1. 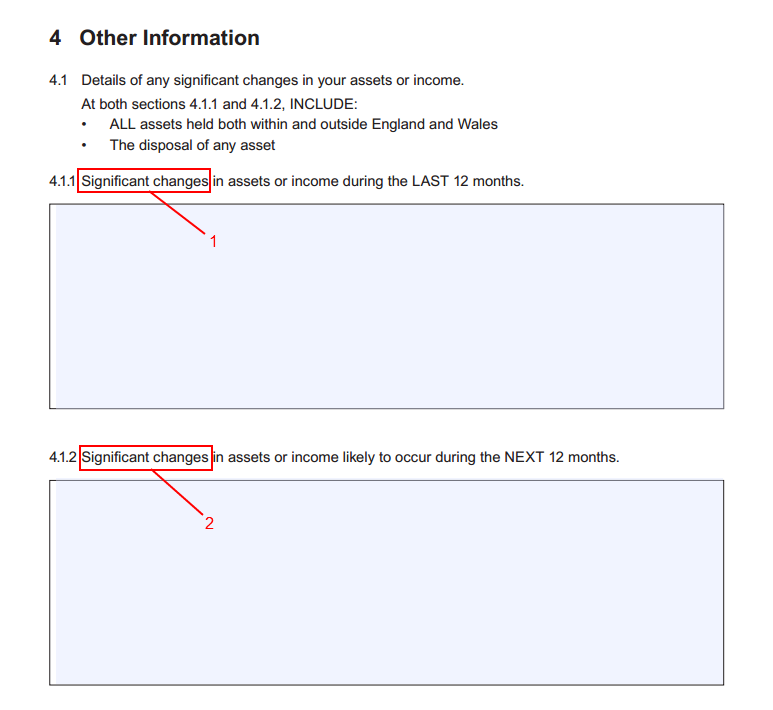 Significant changes in assets and income during the last 12 months - please note the word ‘significant’ in the question: don’t enter relatively small changes here. Examples of things you should list would be a significant pay rise, an inheritance received or a large debt acquired through a business failure. 2. Significant changes in assets and income likely to occur in the next 12 months – again, note the word ‘significant’. This is asking you about the future so only put in things which you know are going to happen. Examples would be a bonus that you will receive in the next 12 months or an inheritance where Aunt Joan has died and left you her estate but you have not had any of the money yet. Lots of people, including lawyers, fill this out in considerable detail. My view is that that approach is not necessary and can be contentious. I would suggest you put in one word, such as ‘Reasonable’, ‘Comfortable’, ‘Poor’ or ‘Affluent’ – whichever you think best applies. 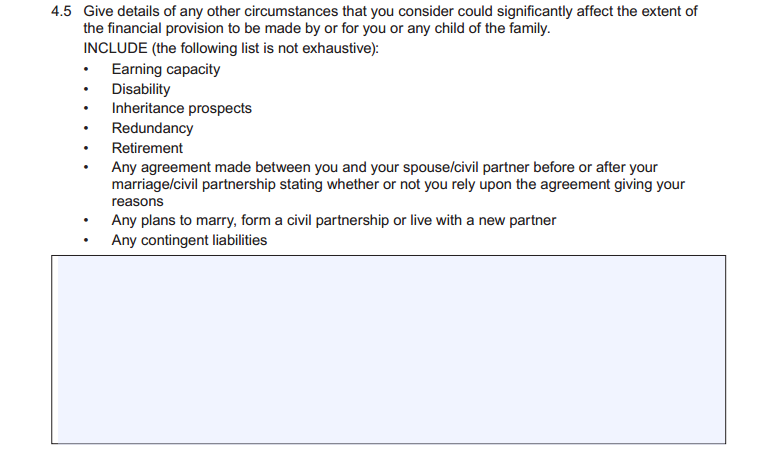 This question asks about specific contributions. Again, I would advise that you remain as neutral as you can here. I often say “We have both contributed to the marriage in different ways” and leave it at that. The reason is that in most cases the specific contributions are not in fact relevant, as the case will be dominated by who needs what, and there is no point in risking inflaming the issue. However if you do feel it is important to put in your specific contributions I would restrict them to ‘significant’ contributions. Examples would be significant assets owned before the marriage, money gifted to you from outside the marriage, inheritances received etc. The fact that you work and your partner stays at home to look after the kids does not make your contribution greater than theirs, nor give you a claim to any more of the assets (despite what you might have heard on the grapevine). ‘Conduct’ is a specific category - and as the section says the behaviour must be exceptional to amount to ‘conduct’. This section is as a result rarely completed and is normally left blank. Examples of conduct that you should list here would be significant financial misconduct (e.g. a significant gambling addiction or such like), or truly awful personal conduct with financial ramifications coming from it. The best example of the serious nature of the behaviour that amounts to conduct is a case I remember from law school - the wife was a surgical nurse and the husband stabbed her through the hand, meaning that she could not do her job anymore. That amounted to conduct. Having an affair (or even a string of affairs) does not amount to conduct and you shouldn’t list it here. This is an important section as it is for any other additional information you haven’t entered elsewhere in Form E which you think may be relevant. I often use this section to provide explanations of other parts of the form that might be misleading or require further explanation. An example would be a business which is complicated in its ownership structure or in what it does, or where a big contract has just been lost, so that the information you have supplied previously in the businesses section needs to be clarified. 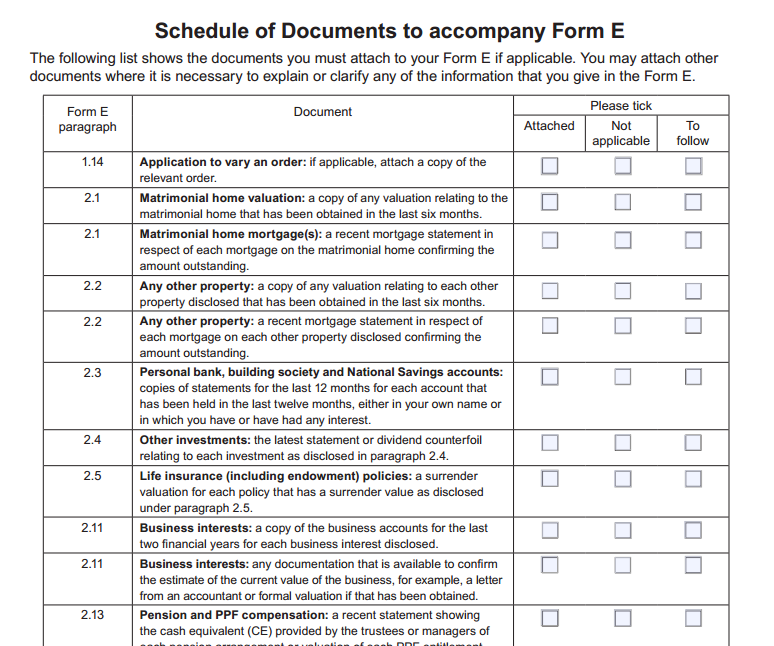 The list on the form of things to include is useful - it is not however exhaustive. Do though only put in what you think is relevant. This is a very contentious section. The section only asks for a summary so please do fill it in accurately. Note that your new partner’s details will rarely be relevant – however the section does need to be completed. Not filling it in will only lead to the request being repeated in the post-Form E requests for disclosure. You need to state here the order you want the Court to make. If you don’t know put in “To be confirmed”; if you do know say what you want. There is no obligation to fill this section in in my view. This is a legally technical area. If you are filling them in you will have legal representation or be a lawyer yourself. Again, this is a legally technical area: if you are filling this box in you will have legal representation or be a lawyer yourself. Hopefully you’ve been collecting these documents for a while – see my post here for more help on how to do this. 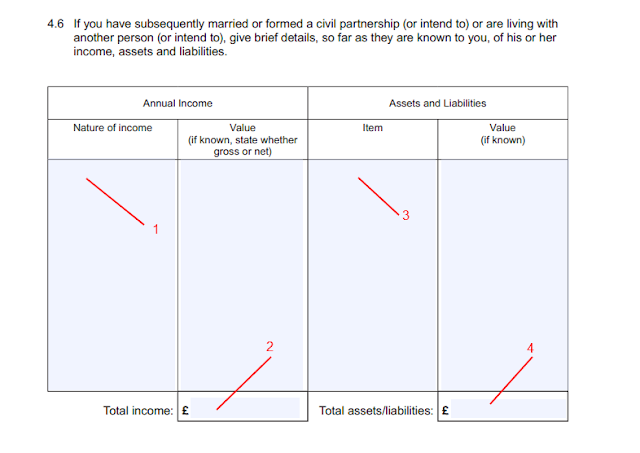 Tick one of the columns in each row, obviously saying ‘Not applicable’ if you haven’t filled that section of Form E as it’s not relevant in your case. If the section is relevant, state if the necessary documentation is attached or to follow.